There are lots of important things to check out when choosing a university. Academic reputation, cost of attendance, and that gut feeling that lets you know “this is the right place.” Those are the kinds of things we’ve batted back and forth on a daily basis the last few months as Son prepares for that next phase of life. But there are other, more personal, characteristics of the university experience that come into play as well. If you’re an athlete, who is the coach and how are the facilities? If you want to travel, do they offer study abroad? And perhaps most importantly, when my dad comes to visit, where will I take him to eat? When I took Son to Golden, Colorado to check out a school, we were very careful to do a thorough investigation into that last point. By cracky, if I’m going to drive 20 hours to go see him, there’d better be a good meal or three waiting for me when I get there. And ramen on the dorm kitchen stove does not meet the criteria. 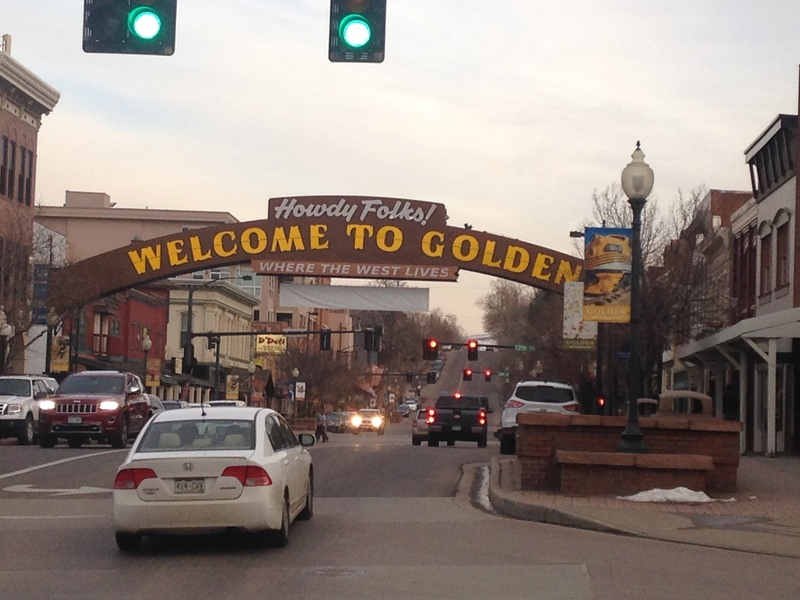 We basically had a full day in Golden to test the waters – and by waters, I am not referring to the famous beverage made from pure, Rocky Mountain spring water. Breakfast and lunch were decided more or less before we arrived, and dinner was a wild card. 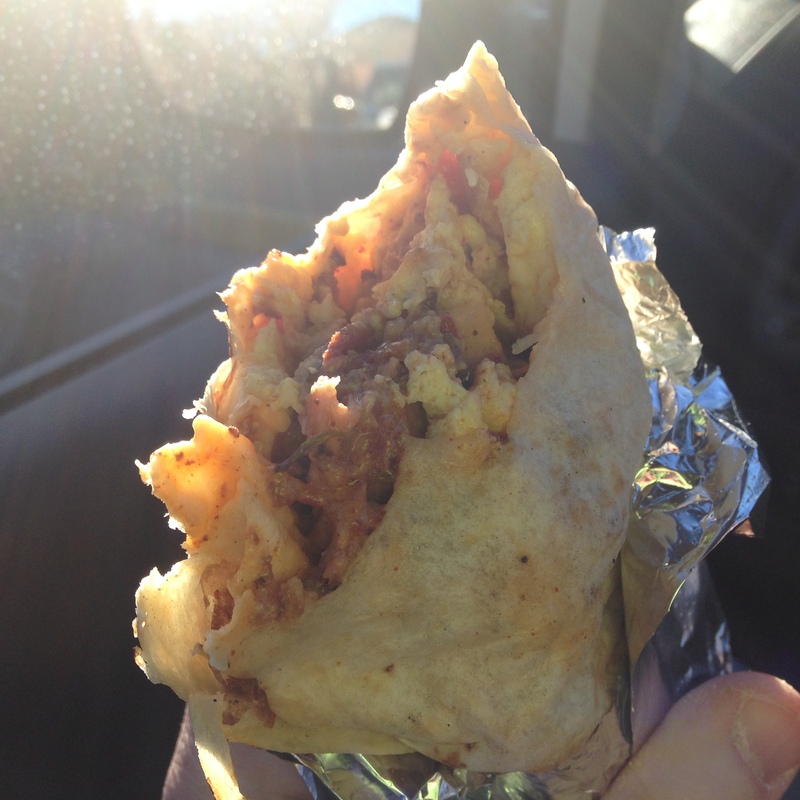 My sights were set on three things: breakfast burritos, burgers, and buffalo. We were in Colorado, after all. Burritos: check. Burgers: check. Yak: check. So much for the buffalo. I’m a big advocate of food truck dining, when it is available and when it is creative. 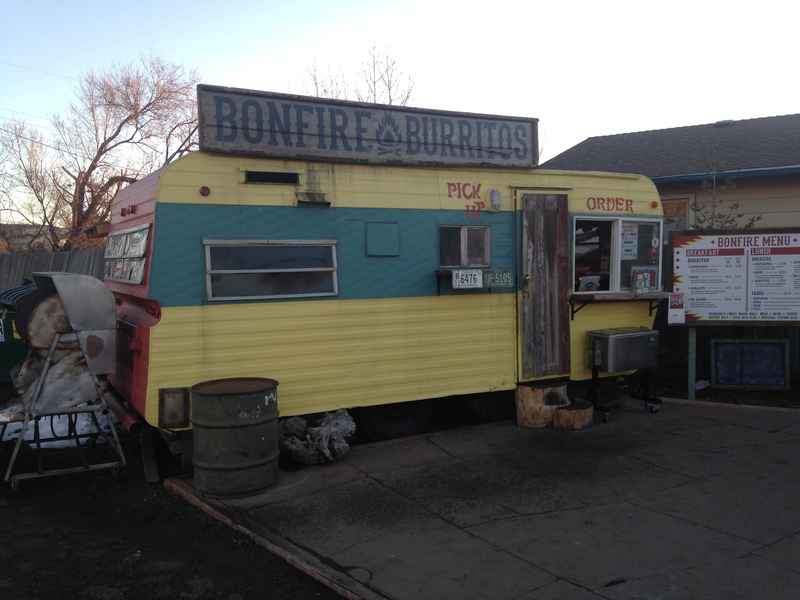 At Bonfire Burritos we scored on both counts. When we arrived, the first thing I noticed was a contraption on the end of the old camper that looked like a raffle drum. This one had a tray underneath full of ash and little white seeds. This was where they roasted the chili peppers: a touch of authenticity already in sight. I ordered the Chupacabra, which was essentially the “meat-lovers” option: eggs, hash browns, chorizo, sausage, bacon, fuego crema, cheddar cheese and green chile. As far as I know, no actual chupacabras were harmed in the making of this burrito. Son stuck with The Classic: eggs, hash browns, cheddar, chorizo and green chile. We both got the small versions and still considered skipping lunch because we were stuffed. Did we skip it? Of course not. We postponed it a little, but there would be no skipping. After the departmental meeting, the campus tour and the info session we went just a few blocks from campus to find Bob’s Atomic Burgers. 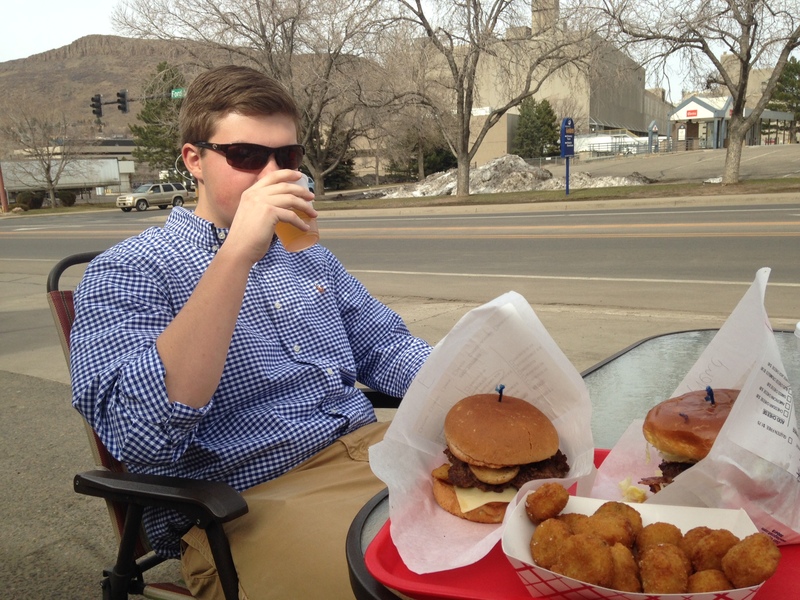 It was a perfect day weather wise, and we were able to sit outside, virtually in the shadow of the Coors beer factory, to enjoy our burgers. At Bob’s, the menu is simple: beef burgers, chicken sandwiches, hot dogs and a quinoa burger. You walk in, check the boxes of what you want on a wax paper sleeve that will ultimately hold your sandwich, and present your order to the nice lady. We both got burgers with random toppings (they are legion), then split a milkshake and a “Boat o’ Southwest Tater Tots” (the special side of the day.) Burger joints with milkshakes make me happy. It’s just the right thing to do. Here’s a tip, though: if you are like me and tend to be a bit of a wimp when it comes to spicy food, never believe them when they say, “The tater tots have jalapeños chopped up in them, but they’re not that spicy.” But they were crispy, hot and cheesy – more of a fritter than a tater tot, an interesting diversion from the norm. The other fun thing about Bob’s was the ordering system. You don’t tell them what your name is, they tell you who you’re going to be. While we waited, orders were brought to Captain Caveman, Mick Jagger, Robert Downey, Jr, and Jerry Garcia (who would have fit in nicely there, I think). We were Sigmund Freud, and after gastro-analyzing the burgers, they were diagnosed delicious. That’s Coors behind him… not in the cup. Dinner was actually the meal we almost skipped. After the burgers we took a quick run up to Red Rocks Ampitheater and then to Buffalo Bill’s gravesite, where we split a Duffy’s Rowdy Root Beer Float. (Remember: we split the milkshake earlier, so now we were just evening out our ice cream intake.) Once we got to the bottom of the mountain, we decided to take a walk down the main drag of downtown Golden, thinking we’d walk to the Sherpa House and decide if we were hungry. Yes, the Sherpa House, as in the people in Nepal who do all the hard work when people climb Mount Everest. We only climbed a hill to get there, and naturally, by then we were hungry. And they had yak. Where else am I going to get yak? There were several yak dishes on the menu, and our server recommended the Yak Sizzler, which was marinated in yogurt and herbs, then roasted in a traditional clay oven. 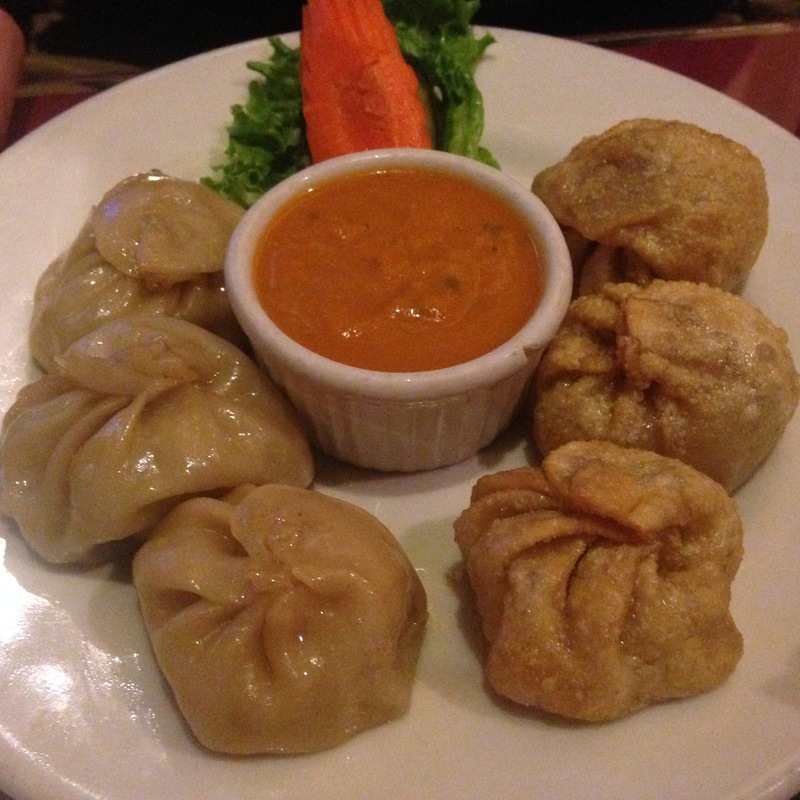 We shared that and a plate of pork momos, some steamed, some fried. The yak tasted like beef (not chicken!) – a good dish, but more of a success from having tried something new than being particularly unique in flavor. I had actually tried a steamed momo before, but the fried ones really hit the spot – my favorite dish of the night. I asked the server where the yak came from – I couldn’t imagine it came all the way from Nepal – and he said it was from Wyoming. Wy not? So now we have a big decision to make, but we certainly can check off the eats box. If you go to Golden, watch for chupacabras, say hello to Captain Caveman, and please – bring us mo momos. We have been in intense decision mode at the Reed hacienda in recent days. Son is a high school senior, you see, and a fine university in Colorado was one of his options. We decided we needed to see it for ourselves and spring break turned out to be the best time to go. So off we went. We were only thirty minutes out of Starkville when we faced our first food decision. Short of some travel supplies, I had already planned a quick stop in Columbus. While in the drugstore we ran across the ice cream section, full of intriguing flavors in handy pint size. Son looked at me with some anticipation, reminding me that it wouldn’t be the first road trip we had knocked back a pint of the cold and creamy. I couldn’t argue the point, and I rarely turn down ice cream, but given the lateness of the hour it didn’t seem like a good idea. We chose not to indulge. But lo and behold, as we pointed the truck back towards the highway, a bright red neon light beckoned us, pulling us in like a tractor beam on the Starship Enterprise. You know this light if you are of like mind. It is round, with hieroglyphics that cry out, “Hot Donuts Now”. This one was harder to pass up. (Did I mention the tractor beam? Pulling us unwillingly across the street and into the drive-through?) Our only saving grace was that we didn’t get a dozen hot glazed. Just four. Because when they are hot, they collapse into the mouth so readily that eating two is basically like eating a single that has reached room temperature. This visit was entirely for Son, but I guess I’ve taught him well: he left the meal planning to me. We could have taken any number of flight combinations to get to Denver, but the best deal happened to give us a little over two hours in the ATL. Usually I’m not crazy about a layover that long, but it would fall at lunchtime and I had a plan. Airport food is not a culinary genre I often crave, but I think the options are improving now. In Birmingham there was a Jim ’N Nick’s and a Good People Brewing company – both have local roots. In Atlanta I spotted a Five Guys Burgers and a branch of The Varsity. I would have easily settled for a chili cheese dog and a Frosted Orange, were it not for another tractor beam that had locked in on us from Terminal E: a place called One Flew South. Along the way in my association with the Southern Foodways Alliance, I kept hearing about this place in the Atlanta airport that actually induced tolerable layovers. I don’t fly that much anymore so this was my chance. After all, how many opportunities does one get to eat at a fine dining restaurant in the middle of the international terminal? And on top of that Chef Duane Nutter has competed on Iron Chef America and is a part-time comedian. Not to mention that I looked up the menu online – they call it “southernational” cuisine – and was sold even before I knew the chef was funny. 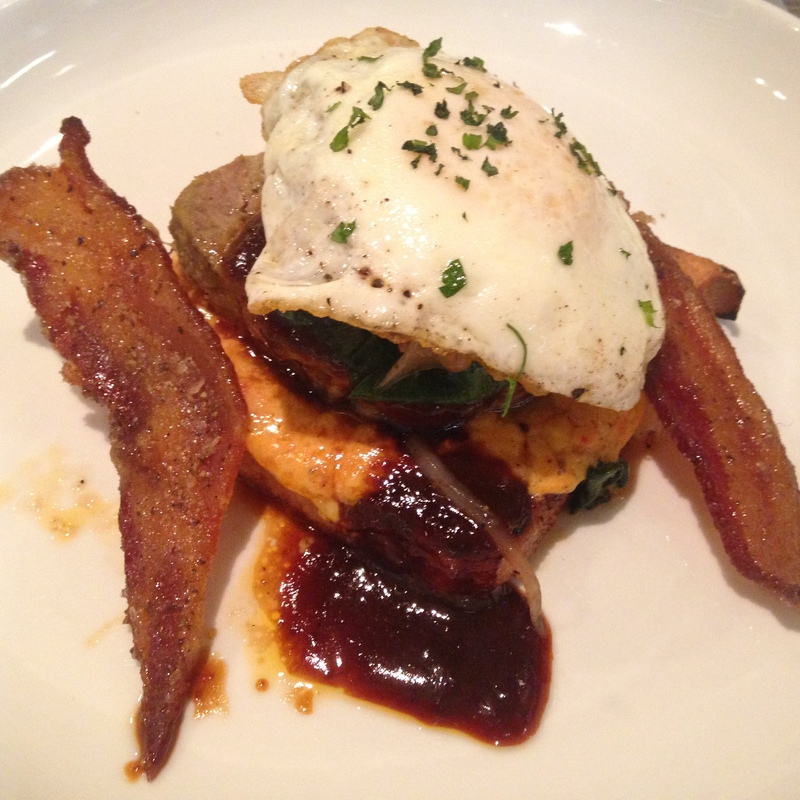 I was especially proud of Son when he ordered the OFS Dirty South: an open-faced meatloaf sandwich with pimento cheese, fried egg, sautéed spinach, Benton’s bacon, and barbecue sauce. Layers and layers of flavor happening on that plate. Son said that the slightly candied Benton’s bacon was the MVP of the dish – I picked the whole team. (Of course I tried his. That’s how it works when I’m buying.) 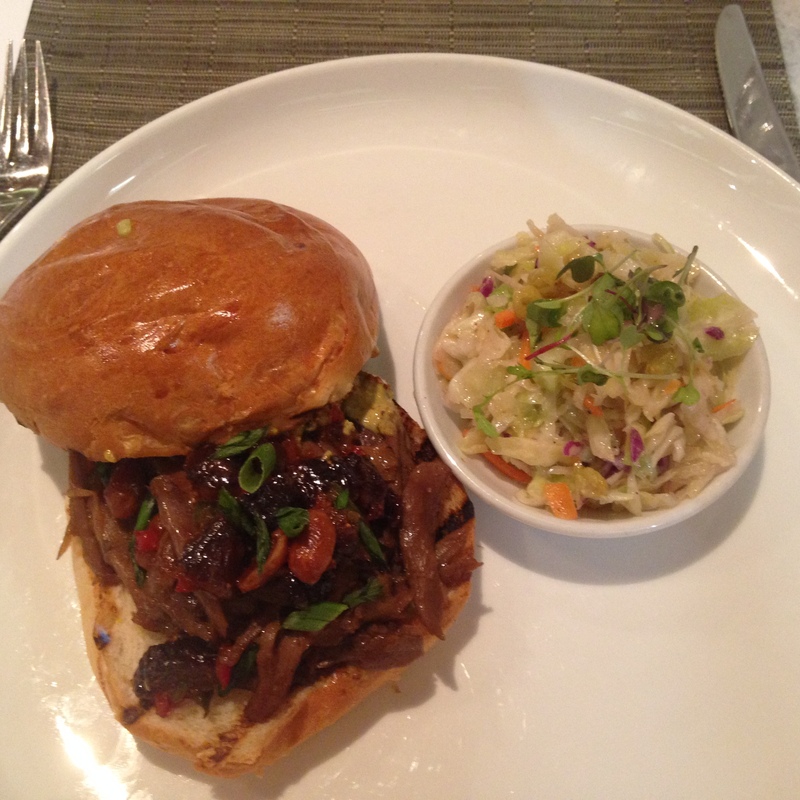 I ordered the Pulled Duck Sandwich: duck confit, fig and peanut relish, and scallions. Pulled Duck Confit. In the airport. I was bordering on giddy. Pulled Duck Confit. This little piggy went oui, oui, oui all the way home. OFS Meatloaf Sandwich framed with Benton’s Bacon. We also tag-teamed on dessert. 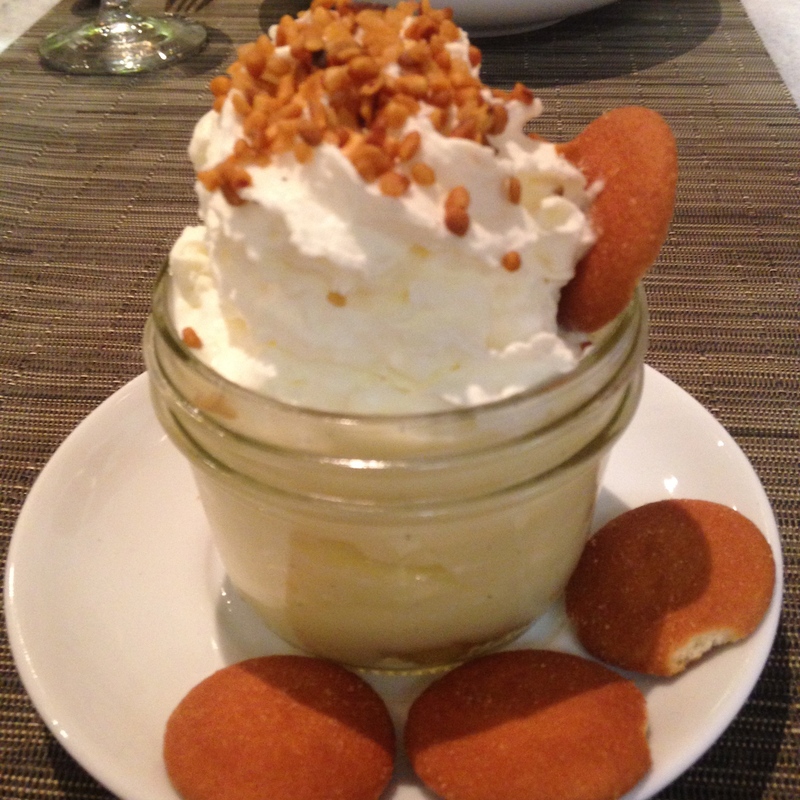 Banana pudding with vanilla bean flecks, house made whipped cream and a hazelnut crunch sprinkled on top. 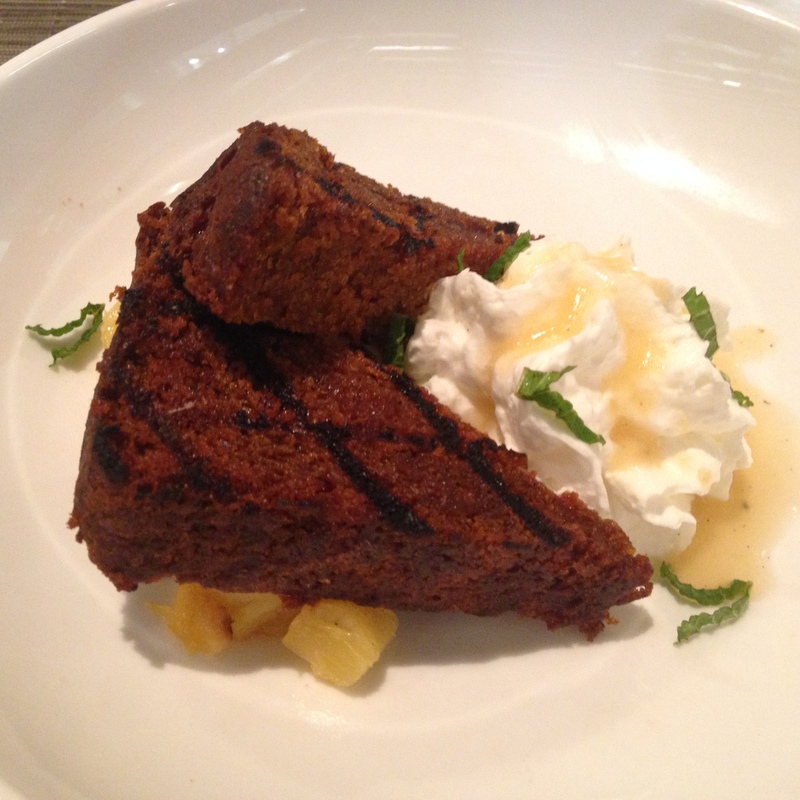 And Pineapple “Not” Upside Down Cake: grilled pumpkin bread, bourbon-braised pineapple chunks, and more whipped cream. Eventually we had to catch a plane to Denver, or we might have stayed and started over. Dinner in Denver was already settled before we left home. First Cousin Y is married to Chef Ed, who recently took over the kitchen at The Park House in the Bluebird District of Denver. 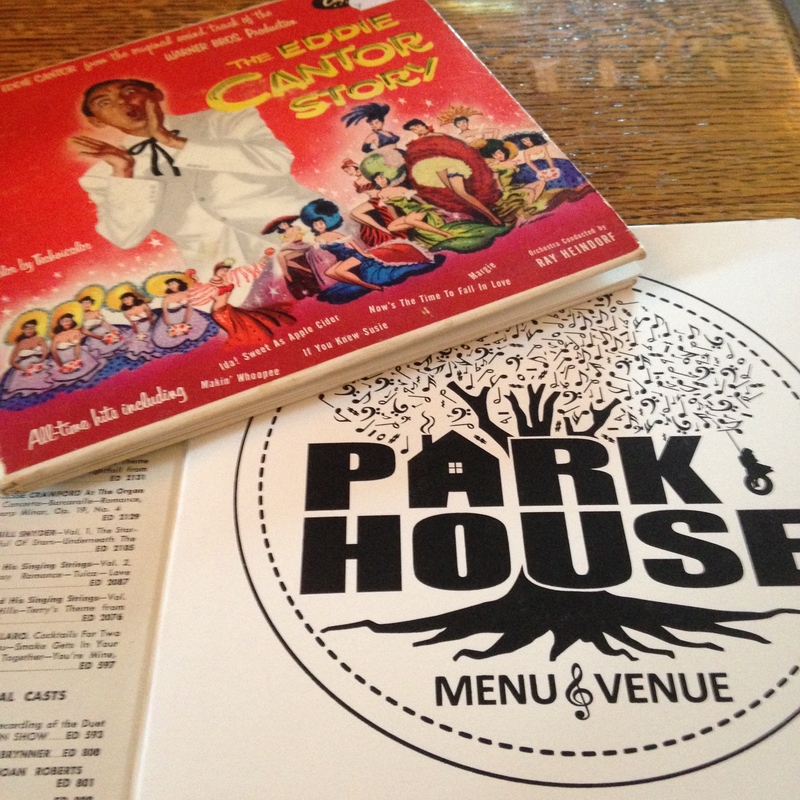 In a previous life, the Park House was a fine French restaurant called The Normandy, serving the likes of Liz Taylor and Elvis. These days they serve a different kind of French food – we know it as Cajun. Chef Ed is not a Cajun himself, but Cousin Y has deep Louisiana roots; as the story goes, when he fell for her he also fell for her food. The signature item on the menu is The Peacemaker, an oyster po-boy. Neither Son nor I are big fans of that particular mollusk, but there were plenty of other Louisiana staples to pick from. 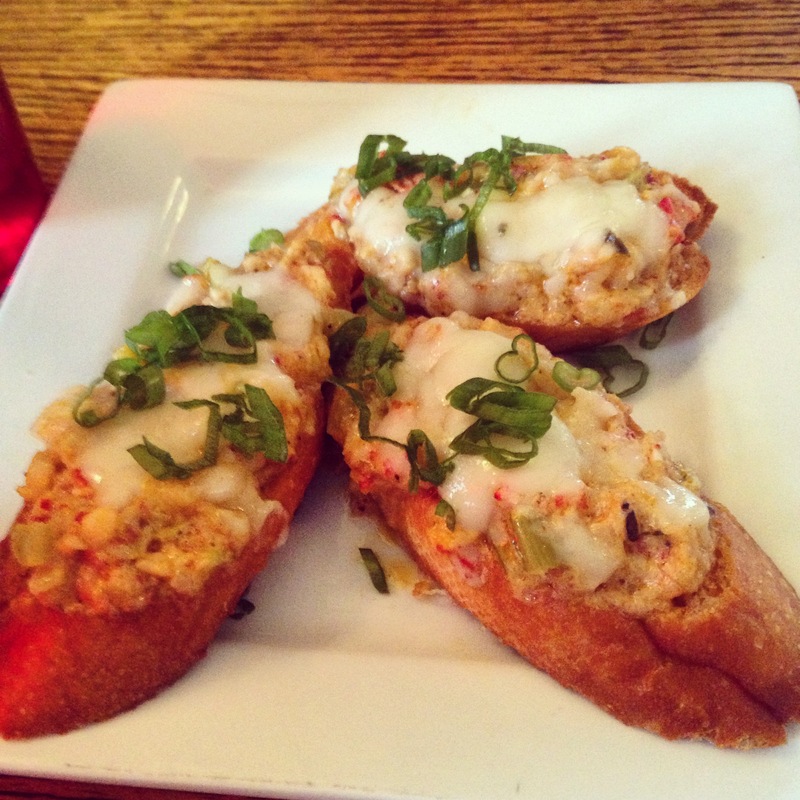 The first plate sent out was Crawfish Cheese toast. I have had similar dishes – in other places – that were okay but not memorable. Chef Ed’s was great. Not overly crawfishy, plenty of cheese, and I’m pretty sure some rendition of the holy trinity of Cajun cooking was in the mix somewhere. 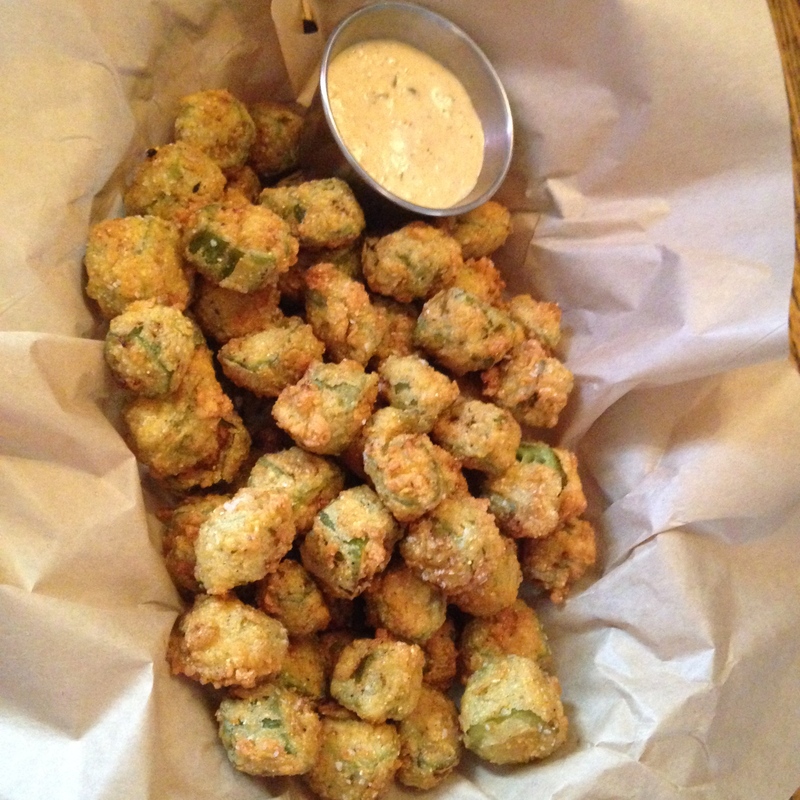 Next out was a big basket of okra (fried as the good Lord intended) with remoulade sauce; Son got a fried shrimp po-boy. I chose beaucoup small plates because I didn’t want to decide. A bowl of gumbo. 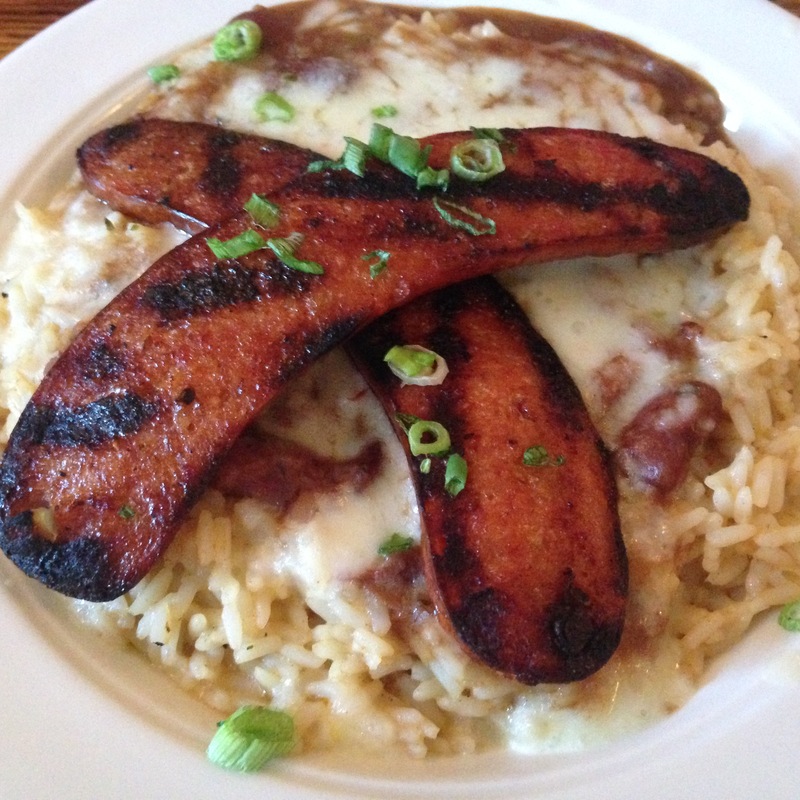 Red beans and rice (with andouille sausage and pepper jack cheese, a tasty new twist.) Good Cajun food in the Rockies. Who’d a’ thunk? I hated to leave even a bite, but as you might imagine, by this point we were stuffed. Plus Cousin Y had been talking up the buttermilk pie (her own recipe) drizzled with blackberry sauce. 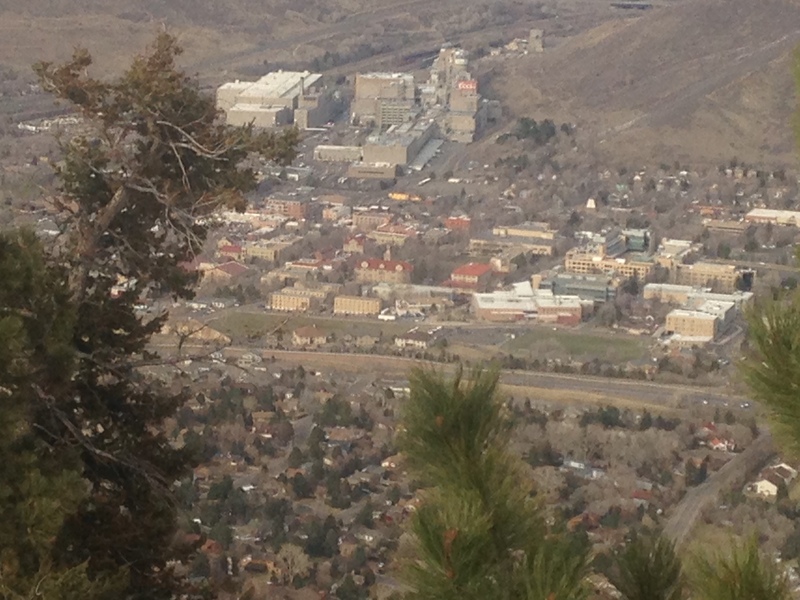 We ate the pie – it was worth the ensuing waddle to the car – then drove on to Golden, where more good eats (oh, and a college) awaited.